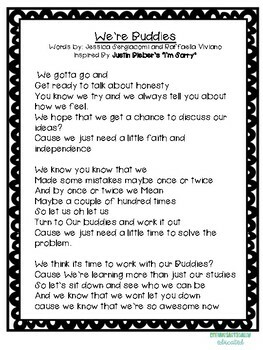 This is a fun song to the to of Justin Bieber's "I'm sorry" Go to youtube and sing this to the kareoke version of the song. Have fun getting together with cross-age buddies buddy. There's no better bonding experience than singing together and coming up with fun choreography. Why not teach kids how to get along and be kind to one another in a fun and entertaining way.